Yong Xi Huo Qing first became available during the Ming Dynasty but it wasn't until Qing Dynasty that this tea became well-known. It originates from Jing County in the western part of An Hui province, and legend has it that this tea was originally processed using tea leaves that were picked from a Jin Yin (Gold and Silver) tea tree. It is so called because the all the leaves from this tea tree were gold on one side, and silver on the other. 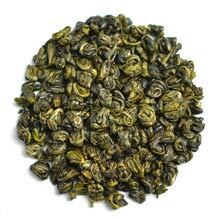 The appearance of Yong Xi Huo Qing resembles Gunpowder tea but it is actually a much higher quality tea. Those who prefer strong and lasting Green teas will like Yong Xi Huo Qing. You will notice a light smoky fragrance and taste at first but this is quickly replaced by a sensational floral sweet taste. Good for multiple infusion. The tea leaves are tightly rolled into small pellet. Dark green in color.